I've been a big tease long enough and decided to show a little bit of my new family room. Now, like the title of my post says, its not 100% done but I just wanted to show some pics in the process. I finished my pillows too- made a dragon one, and some yellow and white striped ones- love them! -re-work the shelves because something about them is bothering me. Other than that a few more tweaks here and there, but I'm loving the color and my new pillows. Hope you all had a nice long weekend!! I adore the paint color! What is it? Nice job with the pillows, too. Perhaps laying some of the books on the top shelf flat will make it all look a bit less vertical. You're so lucky that your landlord has allowed these changes! Hope he doesn't make you repaint it white when you leave! Love that paint color! It looks so good and I love the yellow striped pillow! Thanks for sharing. It looks amazing! I see this and I just love the color, I so wish I could commit. It's coming together so great. I love all of it! Especially that you picked one of my favorite fabrics for the pillow! Love all of it!! That blue fits right in for fall and the room looks great! Check Homegoods for some baskets, I always have luck there. So wish I could paint the new place but we are not allowed. Now if only I could buy a place to do a total renovation! Love it. Looks so great. What color are your walls? They look similar to mine (Monterey White by BM). Love the pop of color behind the bookshelves! It looks simply gorgeous...the mixed fabrics for the pillows, the drapes behind, the lamp and its light, the color on the shelf wall. Beautiful and sophisticated! If you don't get more shelves to divide the larger area perhaps larger artwork or even hanging the artwork up higher in the space would work. I love, love, love it all! It looks amazing, that color is fantastic. Oh, and can I get some of your pillows? Pretty, please. Love the paint color and the magazine holders. I need to get my hands on some of those. Where did you find them? looks awesome!!! the pillows, the paint..it works nicely. Come decorate my house... please!!!! :) You're fabulous. LOVE IT!!! It's looking so gorgeous!!! Love the walls with the blue!!! So perfect!!! Such fun energy & color!!!! Love the teal in the bookcases. the pillows are great colors! Erica and Dave- they are from Ikea- I just painted them white and added a little tag on the front. I do love the color, much more of a statement then the last color! Your landlord is LUCKY. Because you have made this rental a home. It's elegant and gorgeous. Am loving that the blue is an accent vs. a completely overwhelming color. You show such great restraint. 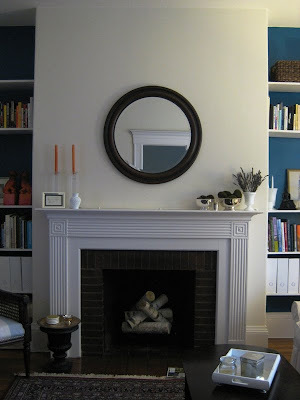 I love that blue and would love to see a stripe, painted horizontally, where the mantel is, a gray blue stripe. love it! Did you see the Elements of Style post? She did a book niche in that same color. I know you thought of yours before you saw it, but I thought that was funny. Looks F-A-B-U-L-O-U-S!!!!! I just pillow for a client that are almost identical! Love it!! I painted over the weekend, but nothing bold like this color!!! It's looking great! LOVE the peacock blue color. If your landlord doesn't provide extra shelves, maybe hang a picture or picture grouping in the "expanse"? How fun! The new pillows look awesome too. I love it...stepping out! Great ideas to finish it off with too! This looks fantastic, Linds! I love your color palette so much and your collection of pillow is so pretty. Wow. From what I can see this is looking amazing! You could not have picked a better color in that area. It truly makes everything pop! Also, I need that striped pillow. Everything looks fantastic! 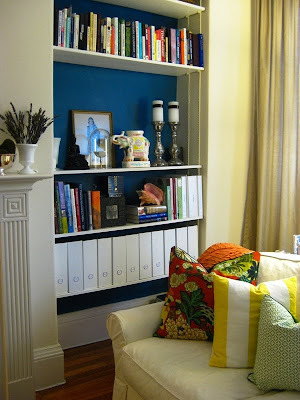 I love your organized magazine holders and the paint color really makes the space pop! Great job, can't wait to see more! Esp. 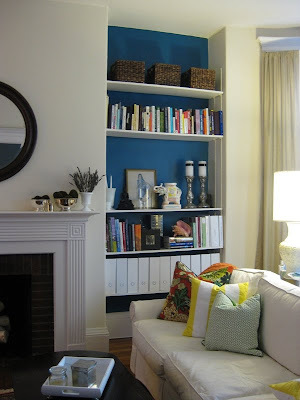 love the blue built-ins background & the detailing on the fireplace surround. It looks so wonderful. I love all the splashes of color and that is a great blue you went with. I think I need to go organize my book shelves now. YOu are totally inspiring me. I love how you painted the shelves! They look fantastic. it looks so good..love those pillows! I'm always scared of peacock, there's a fine line when that blue comes a little to bright -- but this is perfect! I love it!